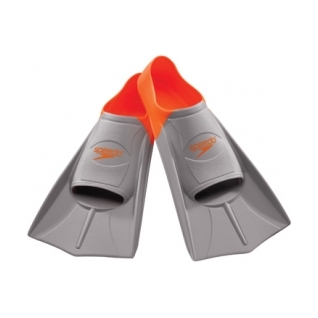 The Speedo Short Blade Training Fins features a Short, straight blade that helps maintain proper kick/stroke tempo! The fins were sized 12-13 for men. I have an 11-1/2 foot size width E. I could not get these fins on my foot. At all. It was annoying and I assumed the fins were made in China where everything is seemingly made too small. Not a good experience. Speedo should be ashamed to sell such a poorly fabricated product.